Ladies and Gentlemen, you have been called here because on the night of last Tuesday, St. Click here to play! Stevenhenry's Feast Eve, a man was murdered here, as you know all too well. Only a handful of people were in attendance other than the victim: Miss Scarlett, Professor Plum, Mrs. Peacock, Colonel Mustard, Mrs. White, Reverend Green, and our friend on the computer. A number of possible murder weapons have been found, and initial inquiries into the nature of the injuries sustained by the victim have concluded that he was shot in the back, dying instantly from the shock caused by massive internal trauma. The revolver that was presumably used for the attack has been recovered. Before the departed died, however, he was also attacked with a lead pipe, an incredibly sturdy candlestick, a spanner, a dagger and the perpetrator even attempted to hang the victim before the fatal shooting. What in blazes?! Argh! The computer-using rapscallion has shot me in the blasted leg! Oi! The vagabond's running away with the bounty! Come on, lads! After 'em! 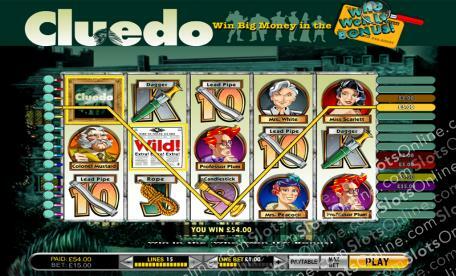 Can you make it out of the mansion alive, free and with a pile of cash in the Cluedo slots? Put your wits and luck to the test today, and pin it all on a less deserving party! The Sunday Echo Newspaper symbol is wild, and substitutes for all symbols other than the Who Won It? Bonus symbol. The bonus game is triggered by 3 or more Who Won It? Bonus symbols on a payline. In this bonus game, a culprit, a location and a murder weapon are randomly chosen. The first two add together, and the last one provides a multiplier. The player may try up to three times, but any rejected offer of a bonus prize is lost, even if the later prize is of a lower value.